An encounter between generations, cultures and artistic visions. 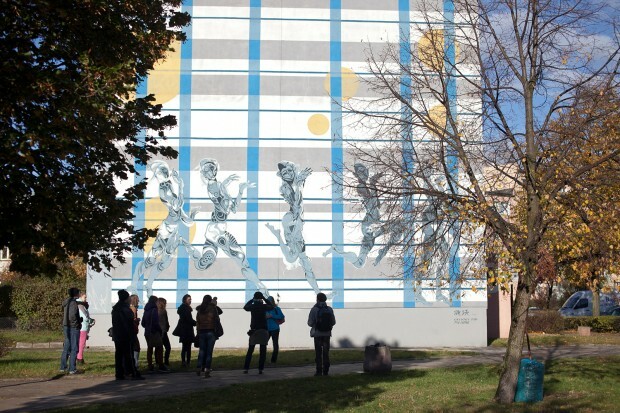 The systematic geometric structures of Edeltraut Rath from Germany and the spontaneity of Pan Li Ping from China meet on a wall in Nagórskiego Street. The result is a mural which really should be viewed in the full sunlight of the afternoon. Lecturer in the Chinese Guangxi Arts Institute. Member of the Academic Association of Chinese Artists. Illustrator at Elephant Museum. She never ceases to draw.